Rarely a week goes by that we don’t find something — a photo, a news clipping, a program, a document, previously unpublished or stored away unseen for decades — that illustrates Manhattan School of Music’s interesting history. It’s exciting to have the opportunity to share some of these with you, especially during our Centennial Season. 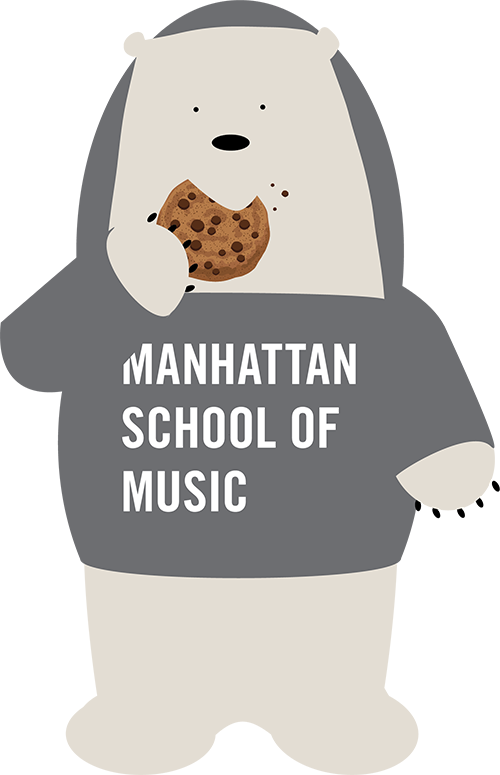 As you might already be aware, every week we create a “Throwback Thursday” post for Manhattan School of Music’s official Facebook page. They are often reposted on the Alumni Association page, so if you haven’t yet joined, please like our Alumni Facebook page and look for these and other announcements of interest. Below are some recent finds and new additions to the School’s archive that could illuminate and expand your appreciation for our storied past. We have recently shared some of these on Facebook, but most have not been posted. We hope you enjoy discovering them as much as we did! 1940 / 1969 / 2017: The hand-carved stone replica of MSM’s seal in the façade of the School’s previous home on the East Side (first photo); as it was later positioned over the entrance (middle); and, after being permanently installed in 2004, in our current 122nd Street lounge. May 27, 1966: Founder Janet Daniels Schenck (center) with NYC Mayor John Lindsay prior to his commencement address. May 15, 1970: Guests at MSM’s spring opera gala, including Dean of Students Josephine Whitford (second from right). May 12, 2005: Scenes from Carolyn Marlow’s tribute to the music of Lerner and Loewe by the MSM American Musical Theater Ensemble. April 9, 1976: Yehudi Menuhin gives a violin master class in Hubbard Recital Hall. March 1966: MSM prepares for the world premiere of the opera The Judgement of St. Francis by Composition faculty member Nicolas Flagello (BM ’46, MM ’49); President John Brownlee (left), a noted baritone, is discussing his role as Bishop Guido II with the composer. 1945: A “Roll of Honor,” listing MSM students and faculty who had recently served in the war effort. Larger version of "Roll of Honor"
March 19, 1976: Pianist Artur Rubinstein gives a master class in Borden Auditorium. 2001: The MSM Jazz Orchestra poses with Director Justin DiCioccio (MM ’71) atop the newly constructed Andersen Residence Hall. February 28, 1970: Composition faculty member and alumna Ludmila Ulehla (BM ’47, MM ’48) reviews a score with a colleague. Winter 1978: MSM’s Claremont Avenue façade as photographed by administrator Louis Brunelli (MM ’50). January 31, 1970: David Diamond, MSM President George Schick, Peter Mennin, and Aaron Copland (first photo) wait in the Grand Foyer for the dedication concert of John C. Borden Auditorium to begin, a program that included Beethoven’s Ninth Symphony and the world premiere of Diamond’s choral symphony To Music. January 31, 1986: Mezzo-soprano Regina Resnik (seated in front), with MSM Dean Martin Smith, surrounded by participants in her master class. January 19, 1940: Saxophonist Sigurd Rascher gives a recital to benefit the MSM Scholarship Fund (from a page of Janet Schenck’s scrapbook). 1927: Young students rehearse in a classroom of the old East 105th Street school. January 18, 2010: MSM presents “Beautiful Girls: Stephen Sondheim’s Songs for Women” starring Zoe Caldwell, Jenn Colella, Donna McKechnie, and the late Marin Mazzie, with Paul Gemignani conducting the student orchestra. December 21, 1939: A performance by the Metropolitan Opera to benefit MSM, with Eric Leinsdorf conducting Wagner’s Tristan und Isolde and a cast that included Lauritz Melchior and Kirsten Flagstad. December 3, 1991: Drummer Max Roach (Undergraduate Studies ’50–52, Hon DMA ’90) gives a Jazz master class in Studio 610. November 15, 1962: Long-time Viola and Chamber Music faculty member Lillian Fuchs coaches an ensemble. November 2, 1983: Members of the Tokyo String Quartet give a master class, coaching works by Debussy and Beethoven. October 28, 1976: Piano faculty member Constance Keene escorts Abbey Simon to his master class. September 1940: Faculty member Hugo Kortschak (right) and guest pianist/composer Paul Creston preparing for a recital at MSM. 1934: Piano faculty member and alumna Dora Zaslavsky (center) with students. September 6, 2006: Mezzo-soprano Marilyn Horne, pictured at the lectern with President Robert Sirota, receives an honorary doctorate from MSM at Convocation. 1962–1981: Pages from the house book kept at “Mostly Dune,” the East Hampton beachfront property, bequeathed to MSM by writer/poet Dorothy Quick Mayer, now owned by the Liebman family. 1962–1981: Pages from the house book kept at “Mostly Dune,” the East Hampton beach-front property, bequeathed to MSM by writer/poet Dorothy Quick Mayer, now owned by the Liebman family. August 1998: Staff and students enjoy a boat cruise as part of orientation (anyone look familiar?!?). June 28, 1974: An amendment to MSM’s charter to authorize the granting of the Doctor of Musical Arts degree. Have any photos with MSM classmates/faculty/staff? Or snapshots of campus and the neighborhood? Help us expand our collection by sending photos from your time at MSM. Share your memories and experiences at alumni@msmnyc.edu or contact John Blanchard to discuss your archival finds (917-493-4496 or jblanchard@msmnyc.edu).